On 24 September 2010, the three-act opera Kaivos ("The Mine") - Einojuhani Rautavaara's first opera written during the years 1957-58 and 1960 - was finally given its live première in a concert performance at Tampere Hall in Finland. Hannu Lintu conducted the Tampere Philharmonic Orchestra, the specially assembled Kaivos Choir, and a cast of leading Finnish soloists (Johanna Rusanen-Kartano, Hannu Niemelä, Jorma Hynninen, Mati Turi, Jaakko Kortekangas, Tuomas Katajala, and Petri Pussila). The composer attended the performance. This production was also recorded in the studio for a CD release by Ondine in early 2011 (ODE 1174-2). The work's underlying thematic allusions to the Hungarian uprising of 1956 impeded a staged production and live performance in Finland, a neighboring country of the then Soviet Union. Instead, a TV production by the Finnish Broadcasting Company (YLE) was broadcast first on 10 April 1963. Subsequent attempts of a live performance had remained unsuccessful, and the work is still awaiting its première in a staged production. 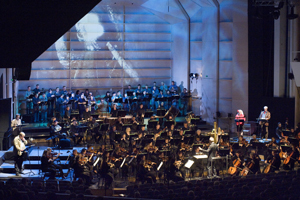 For more information, in Finnish, visit the website of the Tampere Philharmonic Orchestra.